There are a few physical conditions and syndromes that affect humans in various ways. They are not serious ailments, but can lead to serious inconveniences. Snoring is one such example. Both women and men get affected by it and it is seen in people from literally all age groups. The exact cause of snoring can be hard to fathom, but in most instances, it is caused by anomalies in nasal passage or the nasal septum. Pregnancy also induces snoring in some women and nose blockages caused by cold can make people snore. Snoring does not lead to serious health issues, but it can be cumbersome to say the least. The sound of snoring affects others sleeping with the person. When you are in flight or at somebody’s home, this can be quite embarrassing as well. 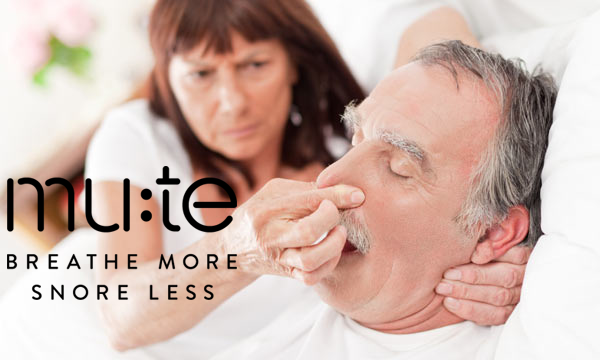 Developed by Rhino med, Mute is a revolutionary device that can be used by individuals affected by snoring. This small device fits snugly on the nose and facilitates proper air flow in nasal passage, thereby eliminating the factors leading to snoring. It has been developed after thorough testing and by deploying latest clinical technology-thereby eliminating any risk. It has got approval from leading entities like Australian TGA and US FDA. It works way better than conventional nasal strips. There are a number advantages of using the Mute Snoring reduction device. Mute does not exert much pressure on your nostrils since it is made of medical grade polymers. It is quite soft and users do not feel inconvenience wearing it while sleeping. Mute lets you sleep peacefully and breathing pattern is not disrupted when you use it. So you get deep sleep and wake up in a refreshed state. Not everyone has the same sized and shaped nose. That is why Rhinomed has made the device in three sizes. The independent dilation system ensures the wearer can adjust it as per shape and size of the nostrils. You can place order for the most suitable variant of Mute easily. Go to the company website and find out which size suits you the best. Initially you can place order for the starter pack of the device. Of course, you can place orders for more than one unit at the Rhinomed website. The website also contains a video tutorial to make things easier or the first time users. If you have any question on the device, shipment or the usage process, you should get in touch with Rhinomed. You can place enquiries through email or phone. Additionally, you may also choose to explore social media profiles of the company. Find out what existing customers have to say about Mute and how it has changed their sleeping pattern. Along with using Mute, you can make some changes in lifestyle to get rid of snoring. This includes cutting down on alcohol consumption, more so before sleep and getting rid of distractions in the bedroom including source of noise.